Hampton Inn & Suites, 8 Hawthorne Drive, Bedford, NH 03110 Ph: 603-623-2040 or 1-800- HAMPTON. This Hampton Inn & Suites is located in the heart of the historical Merrimack Valley. It is the newest addition to the Hilton Family in the Manchester / Bedford area. Minutes from Manchester International Airport, the Hampton Inn & Suites is the business and leisure traveler's first choice in upscale, yet affordable accommodations. The Town of Bow was chartered in 1727. Some say the town derived its name from its location at the bow in the Merrimack River, just south of Concord, New Hampshire’s state capitol. 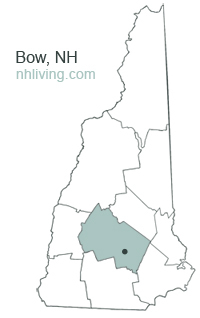 The Town Of Bow is 5 miles South of Concord, 20 miles from Manchester, and 70 Miles from Boston. Bow is home to Blue Seal Feeds, K & A Industries, Inc., and Structures Unlimited. To share any Bow, NH information with us, please contact us. Learn more about advertising in NHLiving.